President Obama delivers tearful eulogy for Beau Biden in Delaware. 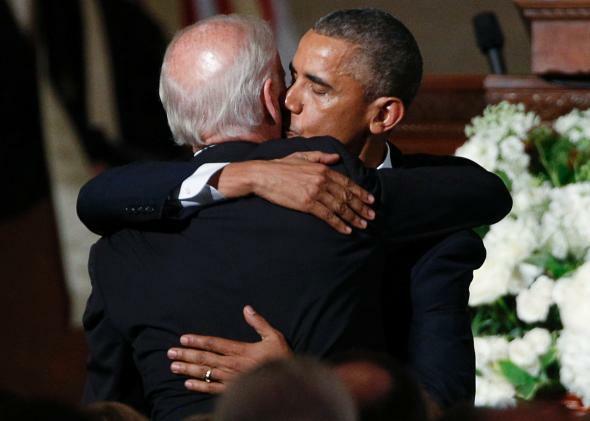 President Barack Obama kisses Vice President Joe Biden on the cheek as he hugs him after delivering the eulogy during the funeral for Biden’s son, former Delaware Attorney General Beau Biden, at St. Anthony of Padua church in Wilimington, Delaware on June 6, 2015. Throughout his remembrance, Obama made a point of emphasizing how Beau Biden lived a life of meaning and worked hard not to take advantage of his family’s name, preferring to work hard when he could have just as easily been handed things. When a police officer wanted to let a young Beau Biden out with a warning for speeding after he recognized his family name, “Beau made him write that ticket,” Obama said. The president, First Lady Michelle Obama and their two daughters joined several Washington leaders, including the Clintons, at the Roman Catholic funeral mass at St. Anthony of Padua in Wilmington for an emotional ceremony that was not just a tribute to Beau Biden but also to his entire family. Coldplay lead singer Chris Martin also volunteered to perform at the service after he heard thorugh a family friend that Beau loved his music, reports NBC News. Senate Republican Majority Leader Mitch McConnell and House Democratic Minority Leader Nancy Pelosi were also present along with other lawmakers and members of Obama’s cabinet. Saturday’s mass involved a type of role reversal for Vice President Joe Biden, who over the years has developed a reputation of comforting those in grief in the wake of the death of his wife and daughter four decades ago, notes the Washington Post.